The Giovanni Quartet provided the musical entertainment at this 4th-annual fund-raiser event, held at the Albuquerque Museum of Art and History. We were located in the beautiful, recently completed lobby, along with dozens of dogs and over 100 dog owners and lovers. Mayor Martin Chavez was there as the host, giving a short speech and showing off his own dog. The event raised nearly $100,000 towards public school programs to raise awareness about Albuquerque’s pet overpopulation problem and the importance of spaying and neutering pets. 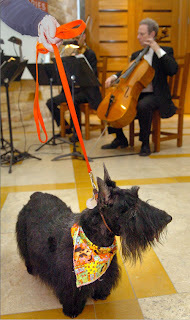 The above photo, by Greg Sorber of the Albuquerque Journal, shows one of the event's canine guests, with our cellist Richard Strauss in the background.